I've said it many times before, but I'll say it again: road tripping is, in my opinion, the very best way to truly experience and explore a new place. I love other forms of travel (especially train travel), but no other form of transit really compares when it comes to the freedom you get from taking to the open road. When you're self-driving, you can stop at every epic viewpoint, turn down side roads, and take as long as you want to get from Point A to Point B. And you can do a road trip just about anywhere. 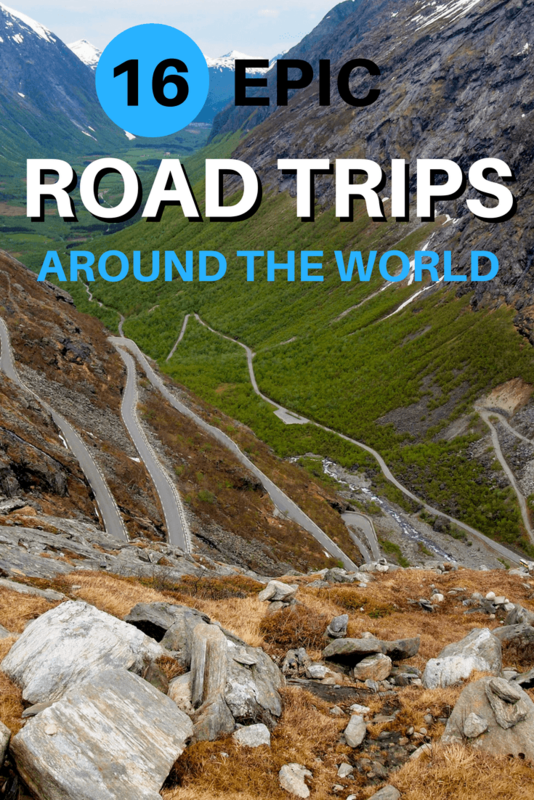 In order to get those road trip juices flowing, I've put together a list of some of the most epic road trips around the world, ranging from multi-week (or month!) adventures to short day drives. What all these drives have in common is that they all deserve a spot on your travel bucket list. The following road trips require some time – anywhere to a few days to a few months. My favorite road trips (so far) have been ones that have included the American Southwest. 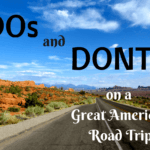 I did one Route 66 road trip that included this part of the U.S. in 2011, and did a second road trip solely dedicated to the Southwestern states of Utah and Arizona in 2016. There's just something about the sandstone arches, tall buttes, and desert scenery in this part of the country that is magic to me. My favorite places have been Monument Valley, Page (Arizona), Zion National Park, Arches National Park, and Goblin Valley – though all the national and state parks in this part of the country are incredible! Most people associate the Pacific Coast Highway (or PCH) with California. But the truth is that the 655-mile road stretches all along the U.S. West Coast, from the deserts of Southern California to the temperate rainforests of Washington state. Hence why this road is one that deserves some extra time. You could start in San Diego, drive up through San Francisco and the redwood forests, stop along the Oregon coast and detour to Portland, and end in Seattle near the mountains in Olympic National Park. Be sure the Snaefellsnes Peninsula is included on your road trip route! Also known as Route 1, Iceland's Ring Road makes a loop around the island of Iceland, covering roughly 830 miles. The drive around the Land of Fire and Ice will let you get up close and personal with everything from volcanoes to waterfalls to natural hot springs. Start in Reykjavik, and allow at least 7-9 days for the journey. Most people drive the Ring Road during the summer months, but it also makes a great trip in the autumn when Iceland sees slightly fewer tourists. Germany is home to many fairy tales, and is also home to the German Fairy Tale Route, or Deutsche Märchenstraße. The route begins in Hanau in central Germany and traverses about 370 miles to Bremen in the north. The route features castles (LOTS of castles), medieval towns, and sights associated with the brothers Wilhelm and Jacob Grimm. OR, you can check out the Romantic Road (Romantische Straße), which covers about 220 miles between Würzburg and Füssen in southern Germany. The route focuses mostly on Bavaria and Baden-Württemberg, linking a number of picturesque towns (like Rothenburg ob der Tauber) and castles (like the famous Neuschwanstein). The North Coast 500 route was officially launched in Scotland in 2015, and claims to be the country's answer to America's Route 66. The 516-mile scenic route begins in Inverness and loops around the rugged north coast of Scotland – one of the (previously) least-visited parts of the country. Driving the NC500, you should expect tiny villages, jagged coastlines, and literally any kind of weather you can imagine. I would say allow at least 5-7 days to truly explore it all. The stretch of coastline between Mossel Bay and Port Elizabeth isn't all that long, but there are enough places to stop along South Africa's “Garden Route” that you'll want to allow at least 4-5 days to traverse it. This coastline features mountains, caves, ancient rainforest, beaches, and plenty of cute guesthouses. You'll want to stop to spot dolphins (and potentially whales) in Plettenburg Bay, and visit the Ostrich Capital of the World (Oudtshoorn). Even though you can easily get around New Zealand by bus, train, or car, the most popular way to traverse its two islands is definitely by campervan. You can climb volcanoes, swim in the Pacific Ocean, admire mountains, see flightless birds, and even visit a Hobbit village. And traveling by campervan means saving money on accommodation without having to pitch a tent every night. My husband and I actually did a campervan trip around New Zealand for our honeymoon! Itching for a far more epic road trip? How does 30,000 miles sound? Because that's the rough length of the Pan-American Highway, which runs from Alaska through the Americas all the way down to Chile/Argentina. It's the world's longest “motorable road” according to the Guinness Book of World Records, though you can't drive through one section between Central and South America – you have to take to a boat to cross the Darien Gap. Lastly, the Mongol Rally is perhaps the epitome of the “epic road trip” for many travelers. It takes place once per year, and requires teams of drivers to buy old cars and drive them 10,000 miles from London to Ulan-Ude “across the mountains, desert and steppe of Europe and Asia.” A number of have done the Mongol Rally, and have all the of breakdowns and wrong turns that you'd expect. Don't have the time to dedicate to multi-day on-the-road adventures? Don't worry – there are plenty of shorter (yet no less epic) road trips around the world that you can complete in less than a day. One of my favorite short road trips is actually just 8.3 kilometers long: the Atlantic Ocean Road or Atlanterhavsveien, a stretch of Road 64 in Norway between the towns of Molde and Kristiansund on Norway's west coast. This little stretch of road is now part of Norway's National Tourist Route and is famous for its coastal views and soaring bridges that connect tiny islands. The road doesn't take long at all to drive, so I recommend stopping at all the viewpoints and driving it more than once in both directions. Australia's Great Ocean Road is probably one of the most famous roads in the world. But the whole thing is actually just over 150 miles long and can easily be driven in a day. The coastal road was built in the early 1900s by thousands of ex-servicemen after they returned to Australia after WWI, and acts as a memorial to their fallen brothers – making it one of the largest war memorials in the world. The Great Ocean Road stretches from Torquay to Allansford in the Australian state of Victoria and is known for its cliffs and limestone rock formations, with the Twelve Apostles being the most famous. Most people use Alberta's Icefields Parkway as a way to get in between two of Canada's most famous national parks, Banff and Jasper. But the 144-mile stretch of pavement is actually an attraction in and of itself. The Icefields Parkway (also known as Highway 93) winds its way past mountains, valleys, cliffs, glaciers, and beautiful mountain lakes. Definitely take the time to stop at places like Bow Lake, Peyto Lake, the Columbia Icefield, and Athabasca Falls. You can do this drive in less than 3 hours in good weather, but I would definitely allow almost a full day so you can stop at all the scenic spots. Hawaii may be made up of a bunch of (relatively) small islands, but that doesn't mean you can't road trip here! The most famous road in Hawaii is probably the Road to Hana on the island of Maui. It's a 64-mile-long stretch of Hawaii Routes 36 and 360, which connects Kahului with the town of Hana. The Road to Hana is known for waterfalls, coastal views, volcanic beaches, and lush tropical rainforest. It's also an extremely winding, narrow road – don't be surprised when you have to cross lots of one-lane bridges! Fun fact for you: The 75-mile-long Historic Columbia River Highway was the first planned scenic roadway in the United States. The highway traverses along the Columbia River Gorge on the border between Oregon and Washington state, the largest designated National Scenic Area in the U.S.
You may not be able to say the name of this road in Romania's Fagaras Mountains, but you'll want to drive it anyway if you're in the area. The 56-mile Transfăgărășan Highway became famous after being featured on “Top Gear” in 2009, and since then has been named as one of the most spectacular drives in the world. The road twists and turns through what many people refer to as the “Transylvanian Alps” and includes 5 tunnels and hundreds (yes, hundreds!) of bridges. If you want to drive this road, be sure to visit between June and October, as weather closes the road for most of the rest of the year. Lastly, the road along Italy's Amalfi Coast is another short but epic drive. The snaking road between Sorrento and Salerno is only 31 miles long, but there's plenty along the way to make the drive last a while. Along with taking in the stunning ocean views when you're not navigating hairpin turns, you'll want to allow plenty of time to admire the many colorful towns and picturesque villages clinging to cliff faces along the way. Must-sees include the towns of Positano, Amalfi, and Ravello. What road trip is currently at the top of YOUR bucket list? Good list, Akatuki. I always tell people going to Maui to drive out to Hana and go up the underside on the old road. It’s scary but worth it. 🙂 Last year I rode from Anchorage to Valdez by bicycle. Amazing. It would also be an awesome roadtrip of 300mi and you can dock in at the ferry to Whittier and sail through the Prince William Sound. Just make sure to get your car ticket early. Great suggestion! Alaska sure does have plenty of epic scenery! It’s an iconic one for a reason! There are just so many cool road trips! I’m sure I’ve missed plenty on this list that I don’t even know about! We’ve done most of the road trips on this list. Iceland’s Ring Road is certainly epic. The Amalfi Coast can be done in one day, but god, why would you want to? Travelers need at least 2-3 days to do it proper justice. The Romantic Road in Germany is a nice option for the novice traveler, in that it can also be done by public transportation. I definitely agree about the Amalfi Coast! A few days would definitely be best. For a minute there, I thought you WEREN’T going to include the Icefields Parkway!!! I would add more Australia to the list – there are just so many! Sydney to Cairns, outback road trips, the Nullarbor, and Perth to Broome are the ones that spring immediately to mind (most of them are still on my wishlist!). I did wonder if the North Coast 500 was a new thing, considering I had never heard of it until last year! I definitely need to explore more of Australia! And yup, the NC500 is new. I mean, I imagine the roads have been there for ages, but they’ve just started promoting it recently. Great recommendations! I wish I could do all of these; road trips are my favorite way to travel. We just bought a 14′ foot trailer. Super excited to take it on its first real road trip in August to Portland. Eventual road trip goals: driving through the Yukon to Alaska and completing the Ring Road in Iceland. Awesome! I agree that road trips are such a great way to travel, no matter where in the world you are! I’d like to visit Romania at some point–that highway sounds like you need an experienced local to drive it in places! Of interest, there’s a book titled “Route 66 Encyclopedia” by James Hinckley (2016), on the history and places of the famed highway. What an amazing article. We have been lucky enough to do the Canada’s breathtaking Icefields Parkways as well as the Great Ocean road in southern Australia. We would love to do some of the other amazing trips your have highlighted especially the Iceland Ring Road. Thanks very much for the feature, and for the comment! Iceland’s Ring Road is still on my to-do list, too! How many of these have you done? I just came back from doing the Ring Road in Iceland and it is definitely amazing. It took us 9 days (not counting Reykjavik) and I still missed a ton of things I would have loved to see. I’d say I needed two more days even without doing the Westfjords. Also took a couple of road trips in the UK which is incredible as well. 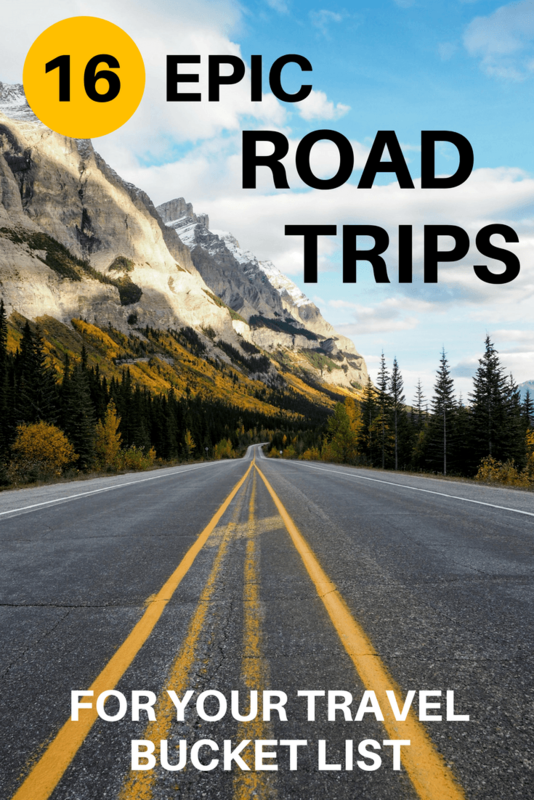 I’ve been wanting to do more road trips and am SO grateful that I found this list! I actually drove the Transfagarasan Highway this past September with my friend. We got a rental out of Bucharest and thank GOODNESS we got a free upgrade to an automatic transmission. I was the sole driver for the trip and had just learned to drive stick 2 weeks prior to the trip. I would also add the Extraterrestrial Highway in Nevada to your list! It’s a great one-day trek in the middle of the desert with a pit stop at Area 51! Oh gosh, yeah I would imagine that’s not a highway you’d want to drive in a manual car if you just learned to drive stick!